uuid : d2e55b73-a131-4de0-80df-94f114a5a923 templates_id: 119515 templates_uuid: "735ebd04-a435-432e-9fa1-8207a8ced3f7" title: "Assignment of Intellectual Property Template - Assign intellectual property" display_name: "Assignment of intellectual property" meta_keywords: "IP assignment contract\r\n" description: "
Transfer to another party intellectual property rights (eg trademark, patent, copyright) using this\302\240assignment of intellectual property. If you want to make sure the rights are correctly identified and assigned and both parties are clear on rights and remedies, you will need to use this intellectual property assignment. What is an assignment of IP? An assignment of intellectual property is an outright transfer of an owner\'s rights, title and interests in certain intellectual property rights (IPRs). The transferring party (\"assignor\") transfers to the receiving party (\"assignee\") its ownership in IPRs. Why do I need an assignment of IP agreement? An assignment of intellectual property, generally, must be formally made in writing showing a clear intention to transfer the IPRs to the assignee. An attempt to assign IPRs without complying with the formal requirements will not transfer the legal title to the assets. This means that ownership will not transfer correctly. Most IPRs can be transferred, including patents, trademarks, copyright, registered and unregistered design rights. Rights in passing-off and confidential information are not property rights and can\'t be assigned as such, however there may be situations which require the assignor to disclose confidential documents as part of the transfer. Who has the rights to intellectual property? As is the case with any registered IPRs, the named entity on the register is the owner of the IPR and therefore is the only person/entity who has the right to effect the transfer. Some IPRs generate moral value in addition to any economic value that is made by exploiting the IPRs. Moral rights protect these non-economic interests and are only available for literary, dramatic, musical and artistic works and film. These rights can\'t be sold or transferred, however the assignor can agree to waive these rights. Moral rights include the right to be recognised as the author or the work or a right to not have the work altered or adapted in a way that would prejudice the reputation of the original author. What are warranties in the assignment of IP agreement? Warranties are a statement of fact, or promises, that the assignor gives to assure the assignee that certain conditions are true. For example a warranty stating that the the assignor is the sole owner of all the rights, title and interest in the IPRs, is a promise made by the assignor. If this statement of fact turns out to be untrue, the assignee is able to claim for damages. What is an indemnity in the assignment of IP agreement? An indemnity is a collateral contract by which the assignor agrees to secure the assignee against any future losses or any legal risks in the future. For example if it turns out that the IPRs transferred does infringe upon a third party and that third party decides to bring an action, the assignor promises to reimburse the assignee for the legal expenses in defending or settling the claim. Does this assignment of IP work internationally? No, this assignment of IP is only governed by the law of England and Wales. It does not guarantee any rights overseas. The assignment can last indefinitely, thereby permanently transferring ownership of the IPRs to the assignee. How do I know I own the intellectual property rights after the agreement is signed? In order to make sure the assignee becomes the new owner of the IPRs it may be necessary to register the rights with the Intellectual Property Office. It is important to make sure the assignee\'s name is on any registered documents and complete any necessary registrations. What if I only want to assign partial rights to the assignee? You can specify what rights you want to assign in the assignment agreement. For example if you have a novel, you may want to assign only the rights to make a film, but retain the rights to publish the novel as a book. The Schedule to this agreement should set out details for what is being provided and transferred as part of the assignment. It is important to be concise and to state precisely what IPRs are being transferred. You should use registration numbers where possible and attach any samples referencing the work and materials. This assignment of intellectual property is governed by the law of England and Wales.
" created_timestamp: "2018-10-08 04:36:34.0" modified_timestamp: "2018-10-08 04:36:34.0" active: true created_by: 236 modified_by: 236 dcm_id: 302 url_slug: "Assignment-of-intellectual-property" meta_description: "Prepare an intellectual property assignment with help from Rocket Lawyer. If you want to transfer ownership rights\302\240to something you\'ve created, follow our easy steps to preparing an intellectual property assignment." time_to_complete: "20 minutes"
Transfer to another party intellectual property rights (eg trademark, patent, copyright) using this assignment of intellectual property. If you want to make sure the rights are correctly identified and assigned and both parties are clear on rights and remedies, you will need to use this intellectual property assignment. An assignment of intellectual property is an outright transfer of an owner's rights, title and interests in certain intellectual property rights (IPRs). The transferring party ("assignor") transfers to the receiving party ("assignee") its ownership in IPRs. Most IPRs can be transferred, including patents, trademarks, copyright, registered and unregistered design rights. Rights in passing-off and confidential information are not property rights and can't be assigned as such, however there may be situations which require the assignor to disclose confidential documents as part of the transfer. Some IPRs generate moral value in addition to any economic value that is made by exploiting the IPRs. Moral rights protect these non-economic interests and are only available for literary, dramatic, musical and artistic works and film. These rights can't be sold or transferred, however the assignor can agree to waive these rights. Moral rights include the right to be recognised as the author or the work or a right to not have the work altered or adapted in a way that would prejudice the reputation of the original author. In order to make sure the assignee becomes the new owner of the IPRs it may be necessary to register the rights with the Intellectual Property Office. It is important to make sure the assignee's name is on any registered documents and complete any necessary registrations. More than just a Assignment of intellectual property template, our step-by-step interview and guidance makes it easy to create your document. Easily create online, download, print and sign your free Assignment of intellectual property in minutes. 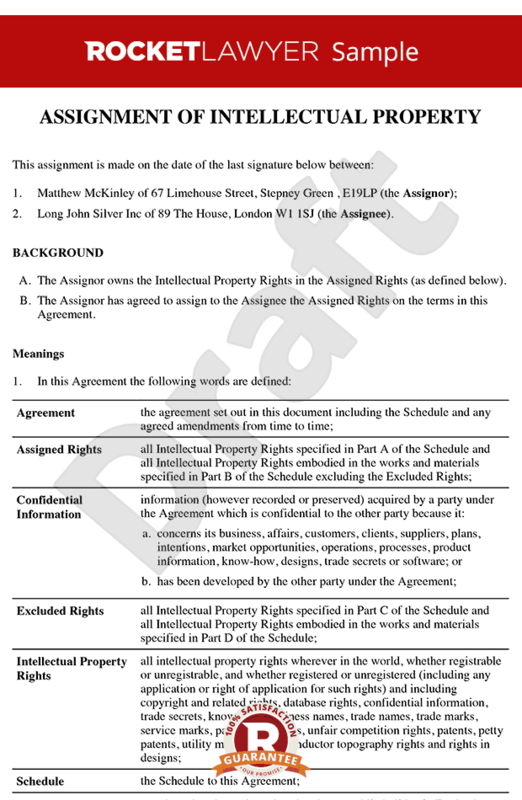 This document is also sometimes called: IP assignment contract .